It was a homecoming for a pair of alumni as the Massachusetts men’s and women’s swimming and diving teams both earned convincing wins over Binghamton in a weekend that was highlighted by a record-setting performance by senior captain Joey Sbordon. Sbordon’s time of 4:01.35 in the 400-yard individual medley broke the old record of 4:02.92 set in 2000. That mark is now the fastest 400 IM time in Joseph Rogers Pool history as it helped lift the Minutemen to a 189-125 victory. The women also saw much success on their end as they swam away with the win by a score of 185.5-133.5. It was only fitting that Binghamton paid a visit to Joseph Rogers Pool on homecoming weekend. Bearcats coach Sean Clark and diving coach Reuben Rappe were both UMass graduates and swimmers under Yarworth. Clark graduated in 1993 and was a five-year swimmer at UMass. He was also a co-captain as a fifth-year senior when he primarily competed in the sprint freestyle and backstroke events. Rappe was a 2008 graduate and was a part of four Atlantic 10 championship teams. He was a captain in his junior and senior seasons and found most of his success in the one-meter and three-meter diving events. Clark and Rappe were reminded right away of the success of their former program as the team of Hao Luong, Timmy Gladyshev, Chris Inglis and Peter Sacco came away with the win in the 200-yard medley relay for the Minutemen with a time of 1:35.56. 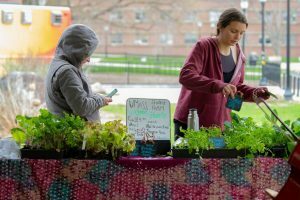 Binghamton would respond with wins in the next two events, but UMass would finish the first day of the two-day dual meet strong in the 1,000-yard freestyle. The Minutemen were led by Sbordon with a time of 9:34.07, followed by Inglis who posted a 9:38.95 mark. 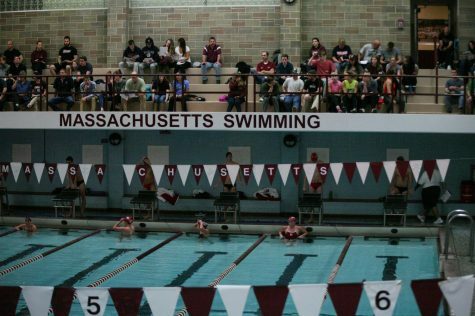 UMass would also boast both the first and second-place finishers in the one-meter diving event. Conor Dunn would lead the way with a score of 291.37, while Alex Merkulov grabbed second with a mark of 261.07. Following Sbordon’s record 400 IM finish was Eric Zeimetz in the 100-yard butterfly with a time of 51.79. 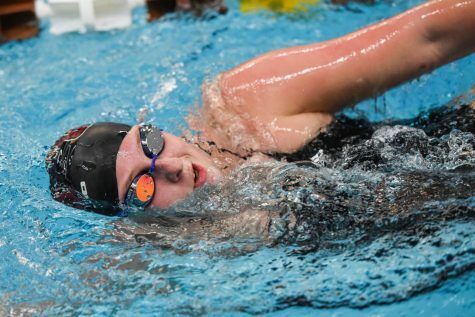 The Minutemen would continue their dominance from there, claiming first and second place in both the 200-yard freestyle and the 100-yard breaststroke. 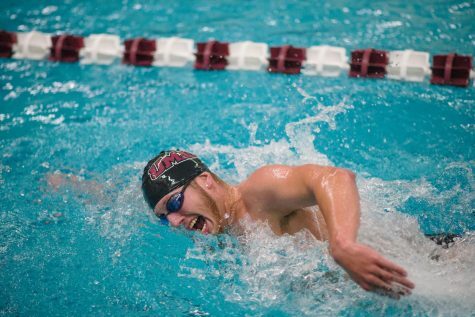 UMass would make its biggest statement in the 100-yard backstroke, where the top four finishers all belonged to the Minutemen, led by Colin Mulcahy who finished at 51.78. That would be all UMass would need from there as it continued to control the meet, coming away with top finishers in all of the events until the final three. 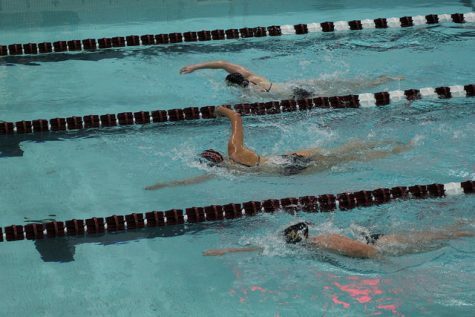 Despite the Bearcats finishing ahead of the Minutemen in the final three events, it would not be enough as UMass cruised to a 189-125 win. Although Binghamton opened up the women’s side with a win, the Minutewomen would respond with wins in the following two events. Katie Arnott came out victorious in the 200 IM, and Zoe Judd just edged out the Bearcats’ Caitlin Kelly in the 50-yard freestyle. Judd’s time of 24.28 just bested Kelly’s 24.32 mark by the slightest of margins. Despite Binghamton closing out Day 1 with a win in the 1,000-yard freestyle by Tiffany Siu with a time of 10:37.96, UMass still ended the day with the lead. The Minutewomen got off to a fast start on the second day, pulling away with a win in the 400 IM, led by Chelsea Downing and Kaitlyn McKenna in first and second place, respectively. Sarah Kanellas would follow suit with a time of 1:00.88 in the 100-yard butterfly, which would upend Shannon Lampe’s time of 1:01.06. 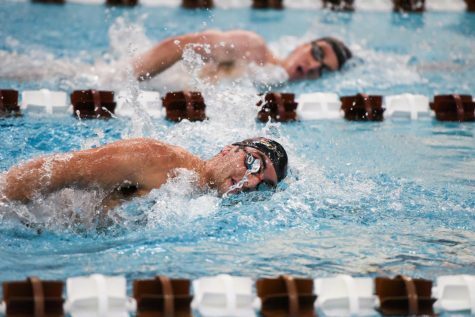 UMass would seize control in the 500-yard freestyle. The top four finishers in the event were all Minutewomen, with Downing taking first place thanks to her 5:13.76 mark. Hannah Markey and Judd would make sure the Bearcats had no chance to claw their way back from there. Markey took first place in the 200-yard backstroke while Judd put Binghamton away in the 100-yard freestyle with a time of 52.19. Both the men’s and women’s teams will have next weekend off as the divers get ready for the Gilbraith Invitational, while the swimmers prepare for the Terrier Invitational at Boston University.